In early 2009 a records management group was cleaning out the Pfizer records retention warehouse in Building 248 on Kilgore Road, Kalamazoo, MIchigan. The manager of the group mentioned to me they had found a dozen boxes containing the last remnants of the Upjohn corporate history files and two boxes of 16mm movies. Wow! This was an opportunity not to be missed. I took all the history files and movies before they were lost. I obtained a 16mm projector and we started watching the movies. Some were from the 1940's, the earliest one being in black and white. We were amazed at what had survived. The movies all ended up being digitized and are now available on YouTube via links on this web site. I started sending out scanned history photos and documents to fellow Pfizer employees. This rapidly turned into an internal web site within Kalamazoo Pfizer. Everyone loved the history. In July 2013 I decided the time had come to create an external website so previous employees and retirees could also enjoy all the history. This is meant to be a fun site where you can see a lot of interesting history you wouldn't otherwise get the chance to enjoy. As of February 2018 there were over 800 web pages and 15,000 images on upjohn.net. Even before I started, Dave Gleason had been collecting history information from the Downtown Kalamazoo operations and had been handing out CDs with thousands of scanned photos. Please note that all the history shown on this site is now in the public domain. 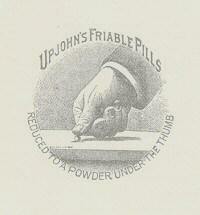 If you have Upjohn history you think others would enjoy please email me and we can figure out how to get it online. If you see your photo or name online and that's a problem let me know so I can remove you. A big thanks to all those who have forwarded Upjohn material to me, including Dave Gleason, Alene and Wubbo Mejeur, Julie Pylat, Joe Timko, Tony Taraszka, Jim DeHaven, Steve DeVries, David Creamer, Roger Stowe, Dave Hilliard, Bill Watson, Tom Runge, Harry Cotterill, Brian Hoff, Linda Bouwman, Stephen Hall, David Westman, Randy Blalock, Randy Stehle, Steve Grieve, Loraine Pschigoda, Ron Kuhn, Nick Gerth, Shelley Miller, John Vanderbilt, Carol Orris, Ian Williams, Deb Withee, Luigi Fracas, Glenn Mason, Bob Salisbury, Bob Betzig, Nancy West, Jan Warreyn, Deb Withee, Kathy Witliff, Ian Williams, Enrique Poucell, Colin Broom, Pam Everts, Rich Smith, John Stodola and Sandy Kerr. A thank you also to Aaron Wilson, who duplicated history DVDs for me a number of times before YouTube was available for showing the films.